1. 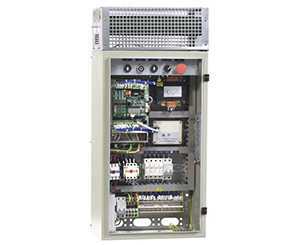 Equipped with the fully upgraded iAstar AS380 drive controller and adopting CAN Bus serial communication method, our roomless control cabinet is easier to adjust. 2. This elevator control system is able to achieve humanized functions such as duplex control, group control, remote monitoring and emergency rescue, making elevator operation safer. 3. Thanks to the new system configuration with car top board and car function board, core quantity of the cable is greatly reduced. 4. Higher stability and better elevator travel feeling are achieved due to the excellent VVVF drive system. Rescue Device: Automatic rescue device (ARD); Electric brake releasing device: Crimp terminals are in the size of 16mm2 and 2.5mm2. Our escalator control system is based on a high performance 16-bits industrial controller, and has great anti-electromagnetic interference and anti static capabilities. The escalator control system has a LCD control board, which can be used to set parameters for the system and show trouble codes. It is compatible with the STEP standard handle escalator controller. In addition, the escalator control system can be optionally equipped with failure monitoring system to improve the system safety. 1. 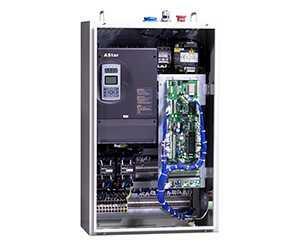 Equipped with self-developed ES.01 escalator controller and iAstar AS500 general inverter, the VVVF escalator control cabinet we offer allows the elevators to start smoothly and able to work under an energy saving mode. 2. Idle speed adjustment of the escalators can be achieved through this escalator control system. 3. Our escalator control box makes escalator operation easier since it is capable of achieving humanized functions such as error report, remote monitoring, I/O extension etc. It can also be operated through a handheld operator. 4. Designed with various kinds of protection functions, this VVVF escalator manipulating cabinet ensures safe and reliable escalator running.